Cooler weather often calls for a big bowl of soothing soup, though truth be told, I’m an all-year kinda girl when it comes to soup. 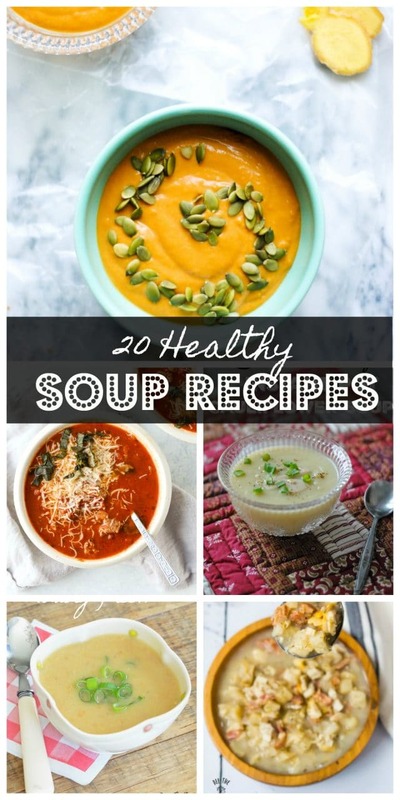 Here are 20 of my favorite healthy soup recipes that can help you get started souping, too! I’d love to hear in the comments which ones look good to you:). 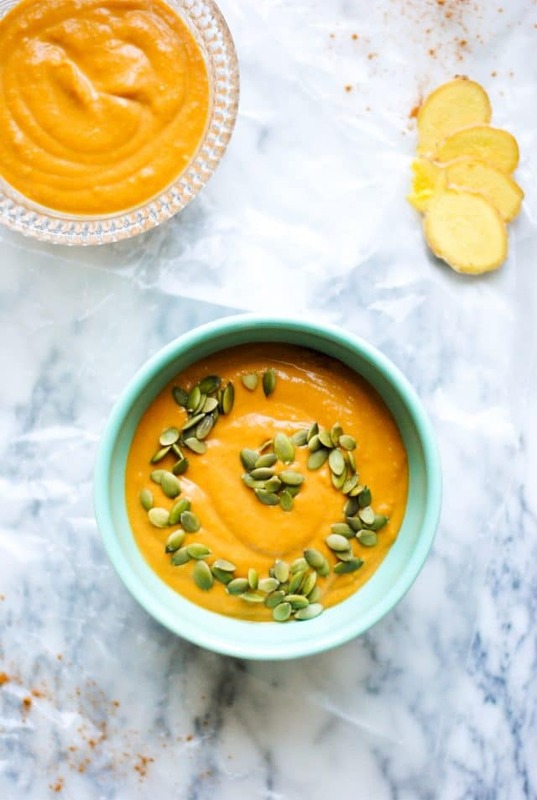 Easy Instant Pot Sweet Potato Soup with Tofu – An easy Instant Pot sweet potato soup soup that’s made with silken tofu. Vegetarian with a pop of protein to keep you warm and nourished. Instant Pot Creamy White Cheddar, Chicken Sausage, and Kale Soup – A flavorful, creamy soup that combines chicken sausage, kale and cheddar cheese which is also thickened up with potatoes and cassava flour. Instant Pot Spinach, Artichoke Meatball Soup – Spinach and artichoke dip marry meatballs in this hearty keto/low-carb veggie-filled soup. Cauliflower Soup made in the Instant Pot – It ain’t cauli pizza or gnocchi, but it’s a darn good soup recipe that offers up the same benefits. Instant Pot Carrot Soup – Gluten free, dairy free and vegan, this Instant Pot recipe may just be what the doctor ordered but certainly doesn’t lack in the taste department! 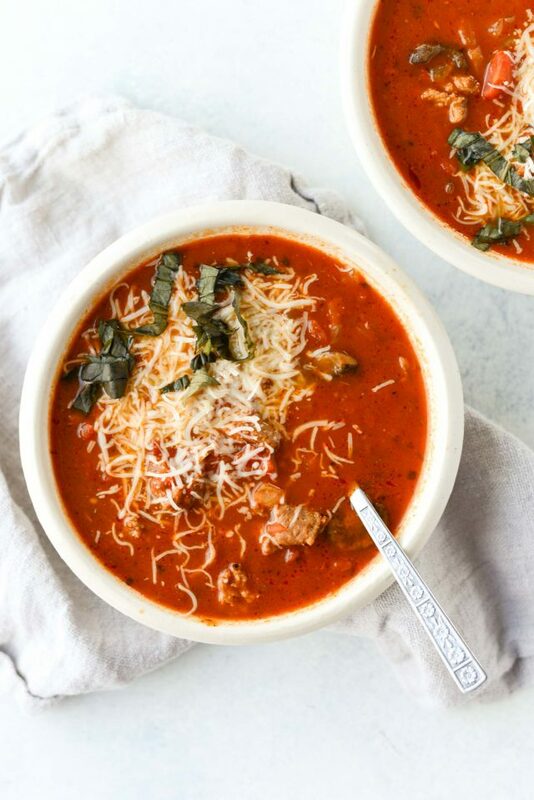 Beef & Kale Soup in the Instant Pot – Savory ingredients paired with sweet coconut milk + a touch of chili powder comes together for a winning combination. Instant Pot Meatball Soup – a deeply flavored brothy soup is brimming with vegetables, herby aromatics and hearty grass-fed meatballs. 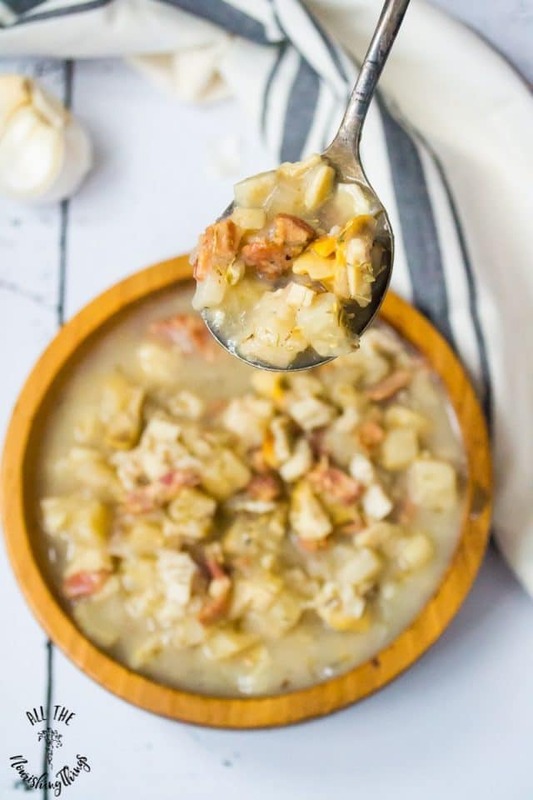 Keto Instant Pot Clam Chowder – A classic comfort food given a low carb makeover. Keto and Whole 30 friendly! Low-Carb Thai Chicken Coconut Soup – A Thai soup recipe that combines bone broth, chicken and coconut milk infused with galangal and lemongrass for a low-carb, gluten- and dairy-free AND Paleo option. Whew! Mexican Meatball Soup with Butternut Squash – Gorgeous, hearty and nutritious AND Whole 30/Paleo compliant. Instant Pot Paleo Creamy Broccoli Dill Soup – Paleo and dairy-free friends rejoice: finally a tasty (and easy!) recipe for creamy broccoli soup, spruced up with dill. Make it in your Instant Pot! Cream of Asparagus, Celery and Zucchini Soup – A versatile veggie-filled soup that’s full of healthy fats. Stuffed Pepper Soup – Flavors and makings of a stuffed pepper, all served up in a bowl. Skip the rice for Paleo. One Pot Healthy Pizza Soup (make without cheese to be Paleo) – All the flavor of pizza all simmered up in a bowl. You’ll never miss those glutinous carbs! Cauliflower Soup made in the Instant Pot: It ain’t cauli pizza or gnocchi, but it’s a darn good soup recipe that offers up the same benefits. Roasted Vegetable Soup: a warm and hearty vegetarian soup that will help you get to your daily quota:). Easy Roasted Red Pepper Soup – A beautiful combo of roasted peppers and carrots that are nicely balanced by a drizzle of olive oil and sprinkle of salty parmesan. Whole 30 and Paleo options included. The Best Lentil Soup – This simple vegan lentil soup is chock full of veggies and ingredients you likely already have in your pantry. 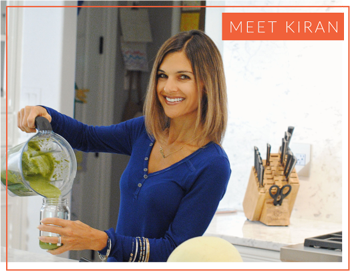 Perfect for that Meatless Monday or any day you are craving plant-based foods and protein. Slow Cooker Sweet Potato Apple Soup – A uniquely slightly sweet and just as savory soup that the whole family will love. 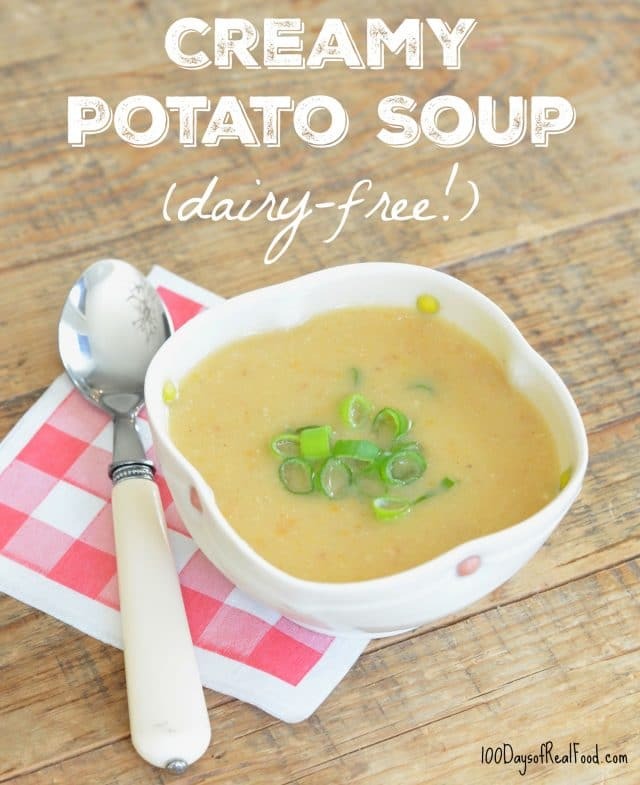 Creamy Potato Soup (Dairy Free) – make without bacon to be vegetarian – A thick and hearty soup that’s free of dairy, but not of flavor. Do you also love soups? Any recipes that I may have missed? I’d love for you to share them in the comments below! Posts may contain affiliate links. Products purchased through an affiliate link have the same costs, but Easy Real Food will receive a small commission. This helps cover some of the costs for this site. We appreciate your support. What a super colleciton! I cannot wait to try these — I think I might just need to work through them one at a time! So many tasty ideas! I love making soup in my IP!!! Soups are the best, right?! Hope you enjoy:). Several of these soups are being added to my ‘to make’ list. Especially the spinach, artichoke meatball soup. I know – looks so good, right?! Hope you enjoy. It’s freezing here so I need some comforting soup!